The Big Picture (2016) is an ambitious look at the world as we know it and how scientific thinking can be used to make sense of most of it. 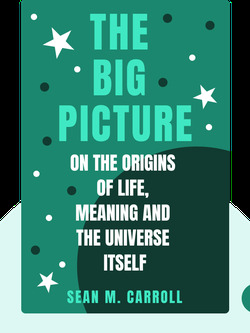 An insightful examination of the origins of life, consciousness and the universe itself, this book gives readers a deductive way of considering the most challenging questions that philosophy, physics and biology have to offer. The laws of physics provide a solid foundation for explaining our world and ruling out pseudoscience. When our ancestors were first trying to explain the natural phenomena of the natural world, they believed it must be the work of all-powerful gods. Today, physicists have a deeper understanding of what causes the sun to shine and the rain to fall. And by using the scientific method and the laws of physics, they can rule out much of the paranormal phenomena that continue to captivate the popular imagination. Frank Wilczek, a physicist and Nobel Laureate, coined the term Core Theory to provide a name for the fundamental laws of our universe. The Core Theory explains how every known particle, such as quarks, electrons and neutrinos, interact with each other and how they're affected by electromagnetism, gravity and nuclear forces. It also includes the Higgs field, which is an energy field that provides all particles with mass. While there are limits to what Core Theory can explain, it essentially covers everything that affects our day-to-day lives. It tells us how light molecules interact with atoms or entire objects, and how it is that a hummingbird can take flight and seemingly hover in mid air. Core Theory contains valuable tools, such as crossing symmetry, which allows us to rule out some of the fanciful phenomena that we find in popular science fiction, such as telekinesis and telepathy. Among other things, crossing symmetry tells us that the particle needed for telekinesis doesn’t exist – because if it did, scientists would have discovered it by now. It’s a matter of deduction: Since telekinesis is the act of using your mind to move objects, there has to be some sort of particle that the mind can produce or manipulate to interact with the matter in the object. Let’s call it Particle X. According to crossing symmetry, if that Particle X existed, it could be created when a proton collides with an antiproton. But there have been countless experiments studying these collisions and there is no evidence that Particle X exists, even under extreme circumstances. This is the same process that also allows us to rule out other paranormal powers such as telepathy and levitation. Causality is not fundamental in understanding how the universe works. The fundamental and emergent theories provide different perspectives for different situations. Time evolves from the past to the future because of entropy. Complex structures arise because entropy increases. Entropy is the reason for the creation of life – and for evolution. The mind doesn’t have to be an immaterial substance. Start your free Blinkist trial to get unlimited access to key ideas from The Big Picture and over 3,000 other nonfiction titles. With bitesize text and audio, it's easier than ever to find the right ideas to transform your life.